Law is considered one of the most promising and lucrative careers in our country today. Although CLAT has come into existence from 2008 from before that and till now more and more people are planning to study law. The best part about the law as a career option is that the market demand and supply ratio is favourable and you'll not only get a job but be spoilt for choice. Law clerk- You are a law clerk when you are interning with a judge. The maximum duration of this internship is one or two years and is considered an option of great repute, opens up a plethora of other options for you since it looks brilliant on the resume. Corporate Houses- You can become an in-house counsel for a big corporate house. These groups might need you to know anything from taxation to environmental laws. Judicial services- You could sit for state wise judicial service exams and once you clear you will be a judicial magistrate first class. Or you could gain litigation experience for a decade then you qualify to become an HC judge. Anyone who has been a judge in the HC for five years or a counsel in the SC for ten years can become an SC judge. It is always good to have a high aim in life and hence law. Advocate on record - The massively popular exam among the best brains in the legal field requires you to practice for four years in a court and undergo a training with an AOR for one year before you can apply. The exam is your gateway into the elite section of lawyers who can start their own law firms. Even without being an AOR lawyer can start their own law firms once they have a good client base. LPOs - LPO also means a decent amount of money and the job is really simple. I have seen people start their own LPO as well. Exams - Even IAS exams are easier to crack with the law as optional subjects. Candidates need to pay the full fee for the admission and all formalities related to admission shall be completed. On 4th July 2019, the CLAT office will receive the status of admission from participating NLUs and the process closes on 6th July 2019. Further process After July 2019 if there arises a vacancy in any national law school it will be filled by NLUs according to the rules agreed to by all NLUs. Life post admissions Below is a brief introduction of all colleges which might give you an insight into what to expect post-admission. A candidate who wishes to apply for CLAT-2019 examination is required to register on the CAPS website, by providing his/her name, father’s name, mother’s name, date of birth, a valid E-mail address, a working mobile number and a password. The NLU Odisha, Cuttack will conduct CLAT Entrance Exam 2019 on May 12, 2019. The CLAT 2019 notification has been released on 20 December 2019. Students who want to pursue for BALLB degree must be familiar with the Eligibility Criteria of Law Entrance Exam. One of the most known CLAT Entrance Exam is an all India entrance test for entrance into the UG and PG courses in 19 national law schools all over India. You should be done with checking how much marks you are going to obtain after having a look at the provisional answer key. You should also be done filing objections if any about how many answers you got right and how many questions itself were wrong so have a look at important dates that you should remember for the remaining admission process. Clear Exam brings you Previous Year Question Papers for CLAT 2019. Law aspirants who will be appearing in the law admission test can take advantage of CLAT 2019 Previous Year Question Papers which are available here free. Clear Exam brings you Mock Test for CLAT 2019. 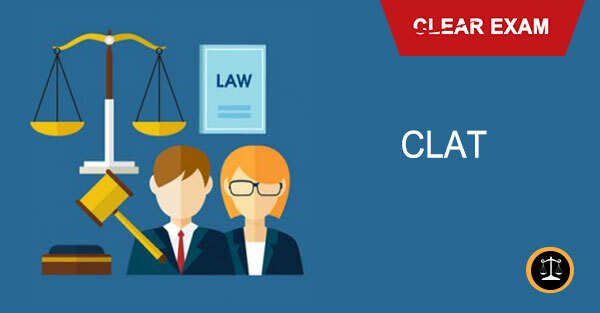 Law aspirants who will be appearing in the law admission test can take advantage of CLAT 2019 mock test papers which are available here free.Candidates who filled the application form of common law admission test could only appear for CLAT 2019 mock test. Experts suggested that mock tests are important as they are so designed to give you a feel for the actual exam. The provisional answer key will be released in on 15th May 2019. Students filed objections such as a particular answer has been wrongly marked or a question was wrong. All objections should be filed by logging in using the registration ID and password assigned to you. The CLAT Results 2019 will be out in last week of 31st May 2019 and after that, a list indicating allocation of seats in accordance with preference will be released on 7th June 2019. Common Law Admission Test (CLAT) is entrance exam test for the candidate to get admission in law courses which is conducted by 18 National Law Universities (NLUs) rotationally every year. This exam is an aptitude test designed to check mental and aptitude abilities in relation to time management. The CLAT Exam 2019 will be organized by the National University of Advanced Legal Studies. Those who are interested in the CLAT exam 2019 can go through this entire article. CLAT counseling will take place between the time starting from 7th June 2019 to 30th June 2019. The fee of Rs 50,000 will have to be deposited and the first merit list students will have to lock the seat or apply for seat-shifting. Second merit list The second merit will be decided on 16th June 2019. The second merit list students have to lock seat or shift the seat by 19th June 2019 and have to pay the counseling fee of Rs. 50,000. Third merit list The third merit list will be declared on 24th June 2019 and the same procedure of locking and shifting seats by names mentioned in the third list will begin on 24th June 2019. Students have to pay Rs 50,000 as fee or candidature will be cancelled. The last date of withdrawing your name from counselling will be 19th June 2019 and if done after that will result in forfeiture of the entire amount. Even when withdrawn by the day after the last date an amount of Rs. 10,000 will be deducted. If you just appeared or appearing for the CLAT exam and are expecting a good rank then below is a list of colleges in which you can seek admissions. If after checking the CLAT answer key your score does not look promising then you can take admission in one of the following colleges. You could also go to these colleges if you prefer one of these particular colleges as against an NLU ranked lower on the scale. Other law schools which accept CLAT scores. You have now gone through the introduction to each college so the last step is to make an informed decision based on how much money you will have to shell out for each college. Wish you all the best for counseling and admissions and especially for your journey afterwards.